Liquid spraying systems are used for painting wood, metal and plastic products. Wood stains, clear and pigmented topcoats, primers and enamel paints and plural component epoxy’s and urethane coatings are all applied with liquid spray systems. A liquid spray system can be as simple as a single HVLP spray gun with a cup attached or utilizing a larger capacity pressure pot for feeding. It can also be more complex and provide a higher productivity when it includes a pump system attached to the spray gun to allow continuous spraying without refilling the cup or pressure pot, or when it requires more fluid pressure such as with air-assisted airless type systems providing higher transfer efficiency and faster production. Adding an electrostatic spray gun to the pressure cup, pressure pot or pumping system statically charges the paint coming out of the gun and provides the benefit of a improved painting process as the paint spray is attracted to the part surface yielding better paint utilization and fewer passes to coat the part. Finishing Consultants delivers industry leading liquid spray systems for industrial, commercial, and manufacturing applications. The liquid spray systems offered by Finishing Consultants can be specially tailored to meet your unique finishing needs. Our expertise lends us the ability to fully understand the complexities of your particular spray system needs, no matter your industry or application. 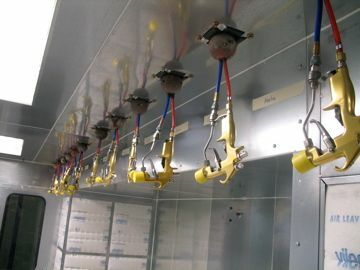 We offer a wide range of liquid spray systems, including HVLP spray guns, plural component metering and dispensing units, fluid handling pumps, liquid electrostatic coating systems, and all necessary liquid spray accessories including fluid filters, fluid heaters, pressure regulators, hoses, fittings and parts. We can help you to determine which liquid spray systems will be best for your specific application.